In my comments on the Moorjani et al. (2011) I argued that admixture proportions presented in the paper are inaccurate, and gave my reasoning behind this claim. Moorjani et al. 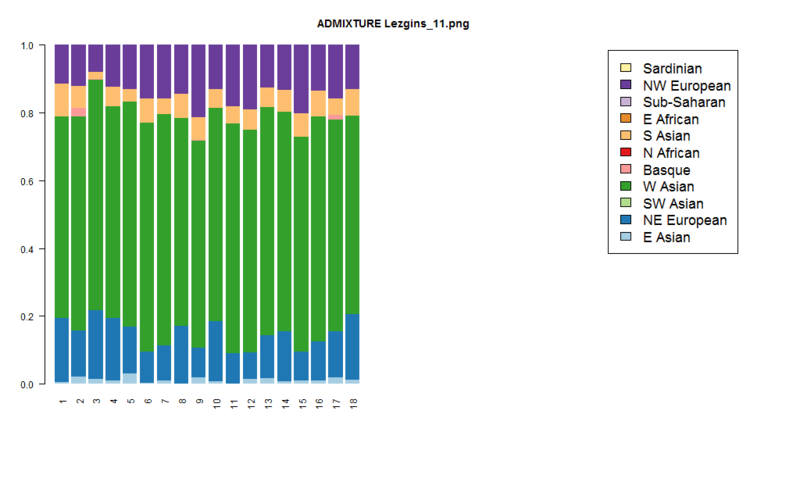 (2011) also present STRUCTURE 2.2 results. Naturally, I wanted to see whether independent admixture estimates on some of the same populations had been estimated in the literature. This brought me to Pugach et al. (2011) which introduced a wavelet-based admixture estimation method called StepPCO. 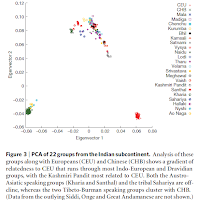 In that paper, the authors presented estimates of the extent and timing of admixture for some populations also included in Moorjani et al. (2011). They also compared with HAPMIX, a well-known method using a completely different methodology, and presented their comparative data in this table and in the body of their paper. 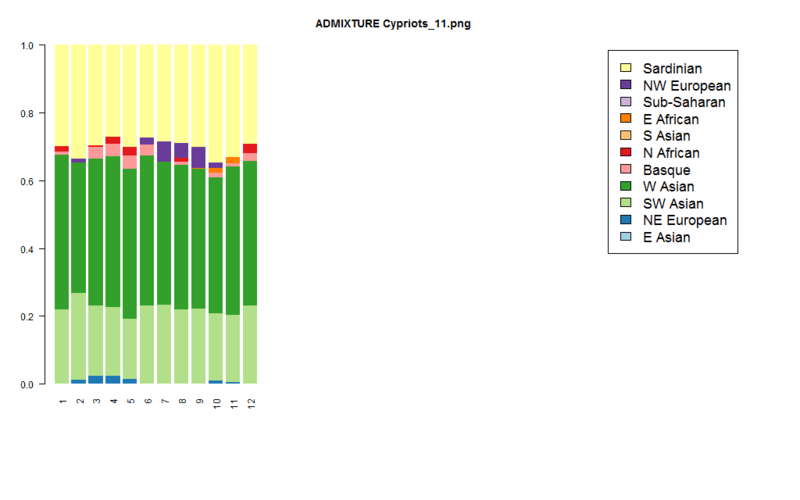 Hence, we now have 4 different estimates of admixture for some populations. 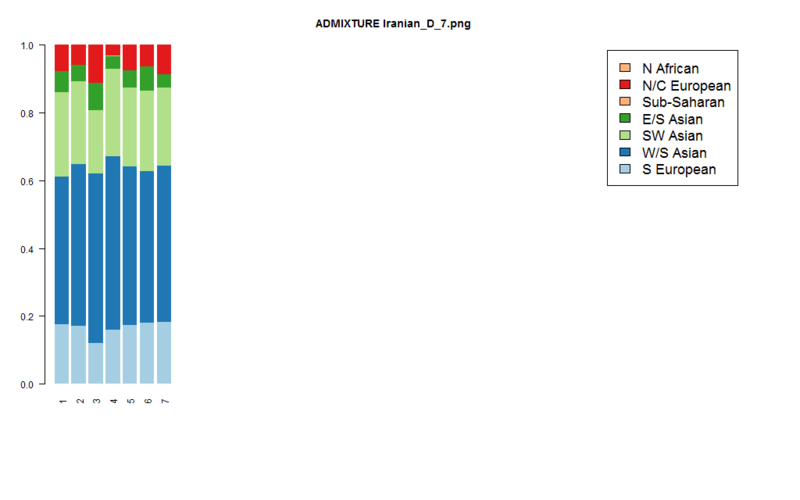 To these, I decided to add supervised ADMIXTURE 1.1 results. I used CEU and YRI as "West Eurasian" and "Sub-Saharan" references so that I would be in accordance with these other methods. The following table summarizes the estimates. 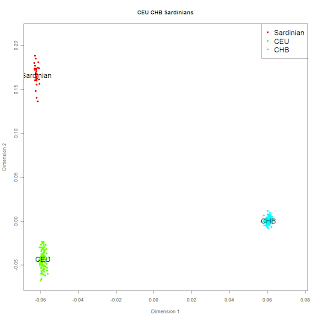 Note that these are estimates of Sub-Saharan admixture assuming two parental populations; also, Moorjani et al. break up the Bedouin sample into the two distinct groups it is composed of, so I have taken a weighted average of the figures in their paper. It is difficult to make meaningful statistical inferences on only a few comparison points, but I do observe that STRUCTURE 2.2 on 13,900 markers gives the higher estimates, followed by Moorjani et al. The other three methods cannot be ordered, giving higher estimates in some populations and lower in others. They all give, however, lower estimates than both Moorjani et al. (2011) and STRUCTURE. As I've explained in my earlier post, Moorjani et al. 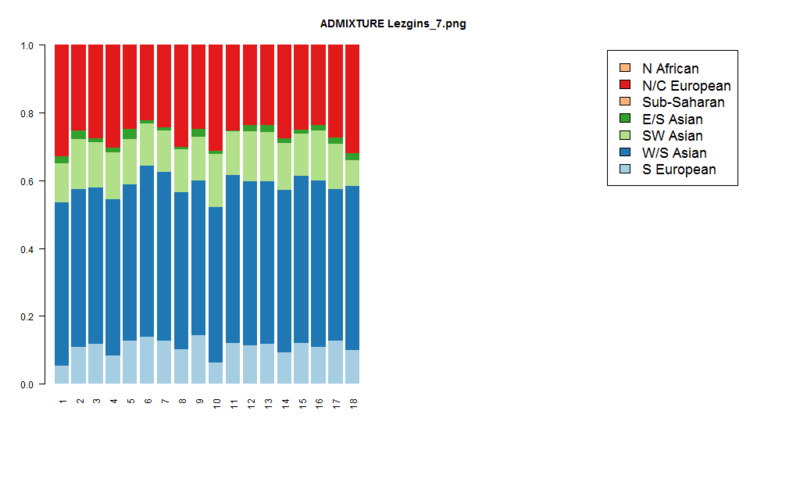 (2011) have higher estimates of admixture because they measure it by comparing populations' shift on the East Eurasian-African axis, ignoring the Asian-shift of North Europeans and adding it to the African-shift of southern Caucasoids. This leads them to conclude a few percentage points of African admixture in populations that have virtually none (such as Sardinians and North Italians, even Swiss French). For populations that do have noticeable African admixture (such as those on the table) their overestimates amount to a a few percentage points. There is no simple relationship between these times, but an obvious pattern is that the dates of Moorjani et al. are younger, perhaps less than 50% of the other two methods. Clearly, the art of admixture estimation is still in its infancy, and different methods provide different results even with a simple 2-population model. I've argued how the results of one method can be harmonized with those of the others, but I don't have a ready explanation about the substantial age differences. Pugach et al. argue that their method is better than HAPMIX, but the differences between the two seem small compared to the differences of both methods to ROLLOFF (the method of Moorjani et al. 's paper). The discrepancy is even more interesting if one takes into account the fact that HAPMIX and ROLLOFF were done by many of the same people. Hopefully, someone will be able to figure out the cause behind the discrepancy. A commenter in my earlier post suggested that ROLLOFF produces younger ages because its age estimation is tied to its inflated admixture proportions; this could be true, however, the discrepancy exists even in populations where the relative difference is small. Historical explanations about the circumstances of this admixture need to be made with some caution, due to the uncertainty about admixture times. For example, a doubling of the Moorjani et al. age estimates would disentangle the Sub-Saharan element in Levantine Arabs from the Islamic epoch. 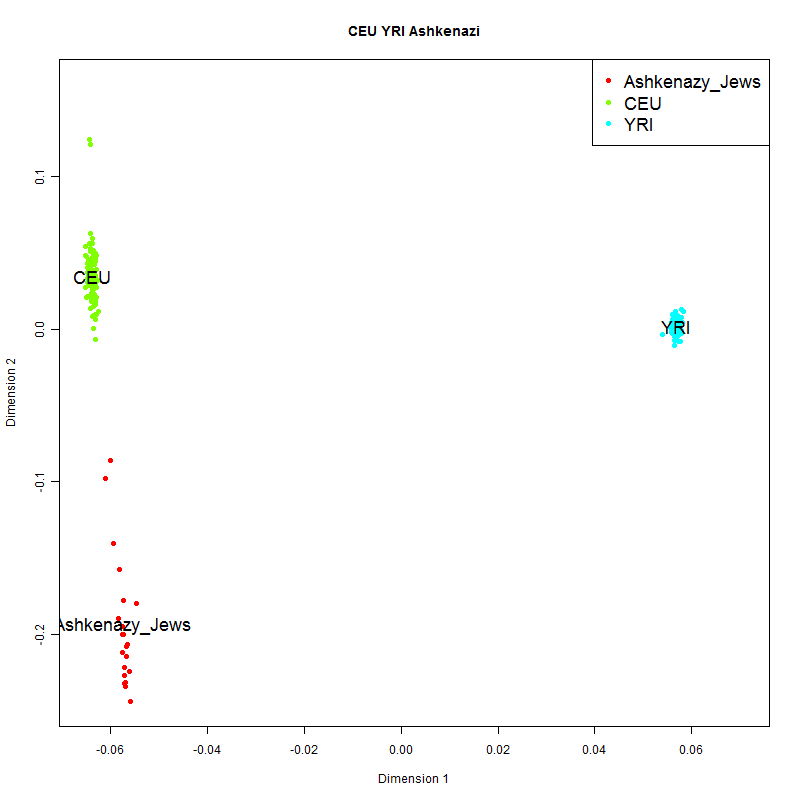 A doubling of the admixture date for Jewish populations, as presented by Moorjani et al. would bring that admixture's age to the middle of the 2nd millennium BC, a period in which the Hebrews were said to be in Egypt, where potentially they may have collectively acquired a small African admixture. Hopefully, with time and full genome sequencing, we will get a better idea of what these African signals in some West Eurasian populations represent. The single recent Out-of-Africa (SROOA) model has been the "default position" in the scientific community for a long time, and it has found its way to popular consciousness by a number of TV documentaries and magazine articles. This model has recently been shaken by the discovery that some modern humans are closer to extinct hominins: the Neandertals and Denisovans. Within SROOA this is quite unexpected, as these groups were thought to be irrelevant side branches of the human family tree: differential affiliation of some modern humans to them means that they are not. This has invariably led to an acceptance that SROOA is basically wrong in its purist form, and an alternative form including some assimilation of archaic hominins is moving to become the new default position. At a later time, different Proto-Eurasian groups became effectively separated by geography and started diverging from each other, eventually evolving to become Europeans, East Asians, Australian Aborigines, etc. Under this model, different Eurasian groups are expected to have exactly the same position vis a vis Africans, once drift is accounted for. Each population's divergence from Africans can be analyzed into two components, e.g., an African-Proto-Eurasian one, and a Proto-Eurasian-Chinese one. The genetic drift (away from Africans) in the first part is the same for all non-African populations (e.g., Chinese or Tuscans), while in the latter it is dependent on population history. The new paper shows why this model is wrong: Europeans are closer to Africans than East Asians are. This is totally unexpected under SROOA, as Europeans are expected to be as distant from Africans as any other Eurasian group (once drift is accounted for). 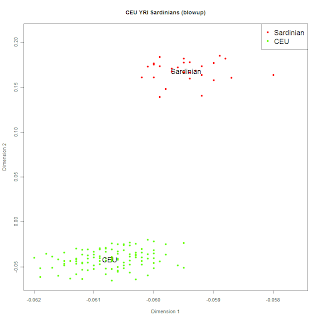 I had noticed this phenomenon in my experiments for quite some time, and highlighted the possibility that haplogroup E1b1b, which is shared by West Eurasians and Africans may have something to do with it. 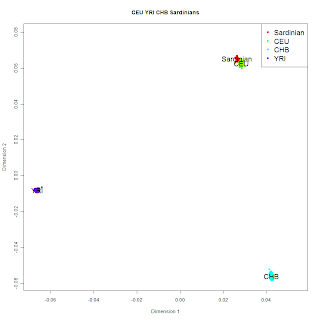 If autosomally African-like populations moved out of Africa carrying these Y-chromosomes, then we would expect only E1b1b-bearing populations to be shifted towards Africans relative to the Chinese. The authors rightly reject this idea because they discover that all European populations, including a wide variety of North European ones, where haplogroup E is non-existent, are closer to Africans than the Chinese are. 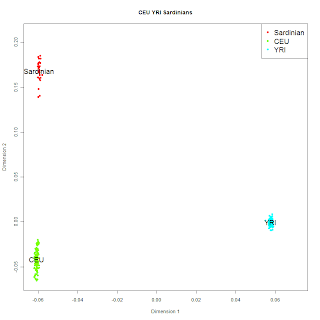 The best candidate of this "common" element (Y-haplogroup E) does not have the expected distribution. The problem can be solved in either of two ways. I have argued for both of them at some time or another, so it would be a good idea for a paper to come out and consider how one could be preferred over the other. The first solution is based on the idea that there has been a major episode of back-migration into Africa that is not captured by the standard model. Clearly, this cannot have been a recent event, as Sub-Saharan Africans largely lack (except in the North and East) certifiably West Eurasian derived markers. But, the event need not have been particularly recent: as long as it occurred after West Eurasians began to diverge from East Asians it would have established the genetic closeness observed by the authors. I believe that the best signal of such a potential back-migration involves haplogroup E. This is the dominant patrilineage of black Africans by far, and almost certainly had an African (and probably an east African) origin. However, its sister haplogroup D occurs as a relic in Asia, among people such as Tibetans, Ainu, or Andaman Islanders. Where did the ancestral clade DE develop? If I was a betting man, I would say that somewhere between the Indian Ocean (where the Andamanese live), and East Africa. An early movement of DE-bearing men from Arabia into East Africa would serve to bring a West Eurasian autosomal component into Africa. That component would then evolve into E in East Africa itself, and go on to (almost) completely replace pre-existing African Y-chromosomes, leaving haplogroups A and B at high frequencies in a few relic African hunter-gatherer populations. 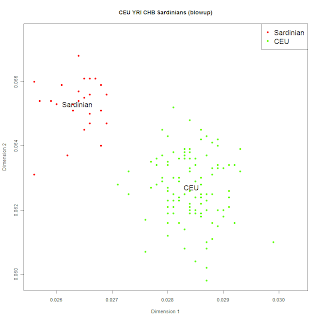 From the Eurasian perspective, the problem would evaporate: West Eurasians' autosomal shift to Africans is not correlated with haplogroup E frequencies, because the latter was not initially associated with a Sub-Saharan-like autosomal gene pool. A second potential solution would interpret African-West Eurasian closeness not as evidence of a common population element in West Eurasians and Africans, but as a consequence of a population element in East Asians that both West Eurasians and Africans lack. The obvious candidate for such an element involves archaic admixture in East Asians. This is no longer an exotic possibility, given the evidence for such admixture that the sequencing of the Neandertal and Denisovan genome has produced. 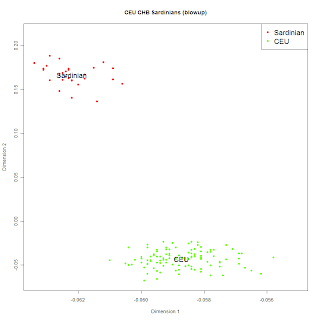 Under this scenario, Europeans and East Asians are genetically close because of their common Proto-Eurasian ancestry, and they both shared an initial same distance to Africans, but East Asians diverged from both West Eurasian and African populations by admixing with archaic humans they encountered in the East. West Eurasians are shifted relative to East Eurasians by y% to Yoruba (who have extremely high E-haplogroup frequencies), and are expected to be more affected by West-Eurasian->Africa back-migration than the San are. If y is larger than x, then the prediction of the theory is supported. It is not clear to me whether East Asian archaics/West Eurasian back-migration into Africa, or a combination of these factors may account for the observed phenomenon. I should point out a second Out-of-Africa expansion into West Eurasia (the authors' preferred model) is also not out of the question, but this cannot be easily tied to a particular event in prehistory or uniparental marker. Genetic and fossil evidence supports a single, recent (less than 200,000 yr) origin of modern Homo sapiens in Africa, followed by later population divergence and dispersal across the globe (the “Out of Africa” model). However, there is less agreement on the exact nature of this migration event and dispersal of populations relative to one another. We use the empirically observed genetic correlation structure (or linkage disequilibrium) between 242,000 genome-wide single nucleotide polymorphisms (SNPs) in 17 global populations to reconstruct two key parameters of human evolution: effective population size (Ne) and population divergence times (T). A linkage disequilibrium (LD)–based approach allows changes in human population size to be traced over time and reveals a substantial reduction in Ne accompanying the “Out of Africa” exodus as well as the dramatic re-expansion of non-Africans as they spread across the globe. Secondly, two parallel estimates of population divergence times provide clear evidence of population dispersal patterns “Out of Africa” and subsequent dispersal of proto-European and proto-East Asian populations. Estimates of divergence times between European–African and East Asian–African populations are inconsistent with its simplest manifestation: a single dispersal from the continent followed by a split into Western and Eastern Eurasian branches. Rather, population divergence times are consistent with substantial ancient gene flow to the proto-European population after its divergence with proto-East Asians, suggesting distinct, early dispersals of modern H. sapiens from Africa. We use simulated genetic polymorphism data to demonstrate the validity of our conclusions against alternative population demographic scenarios. 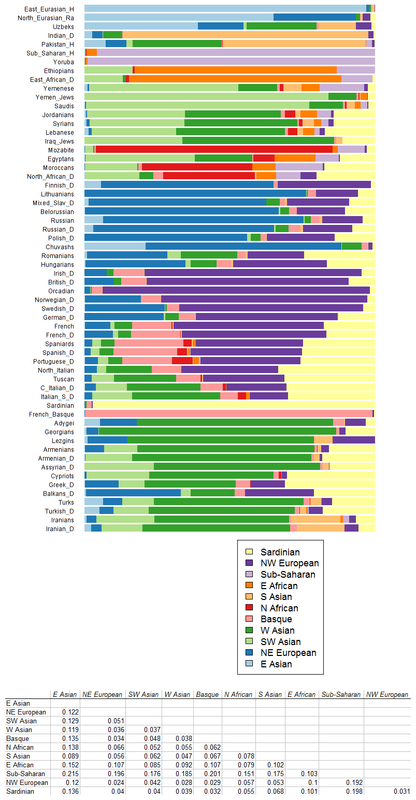 Y-chromosome Haplogroup O is the dominant lineage of East Asians, comprising more than a quarter of all males on the world; however, its internal phylogeny remains insufficiently investigated. In this study, we determined the phylogenetic position of recently defined markers (L127, KL1, KL2, P164, and PK4) in the background of Haplogroup O. In the revised tree, subgroup O3a-M324 is divided into two main subclades, O3a1-L127 and O3a2-P201, covering about 20 and 35% of Han Chinese people, respectively. The marker P164 is corrected from a downstream site of M7 to upstream of M134 and parallel to M7 and M159. The marker PK4 is also relocated from downstream of M88 to upstream of M95, separating the former O2* into two parts. This revision evidently improved the resolving power of Y-chromosome phylogeny in East Asia. The authors make a good argument that if hunter-gatherers had adopted agriculture early on, then there would be a signal of population growth in hunter-gatherer derived haplogroups at the same time as the onset of the farming economy. I don't follow mtDNA age estimation as closely as that of the Y-chromosome, but the fact that their method estimates demographic growth for Neolithic haplogroups that coincide with the onset of the Neolithic, while it estimates earlier growth for Paleolithic haplogroups, does suggest to me that they're onto something. mtDNA haplogroups (7) (Table S1). 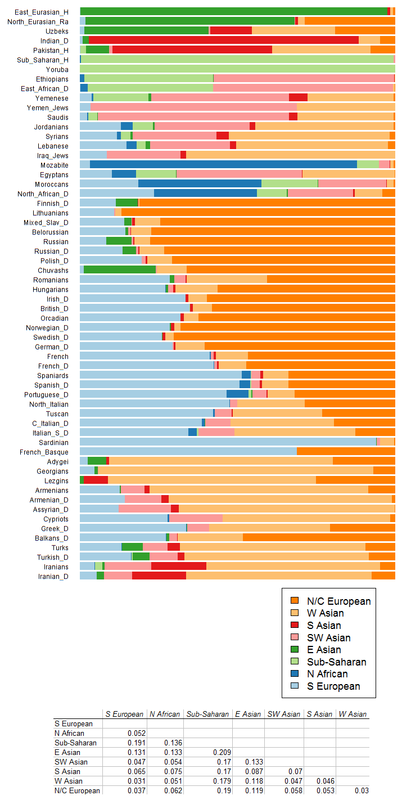 As I've argued in this blog over the last few years, the mtDNA evidence speaks of near total replacement of forager mtDNA in Europe. In a sense there is continuity, as the forager mtDNA has not gone extinct, but I guess that is a matter of words. We could just as easily say that there is population continuity in parts of South America where a predominant Caucasoid population has absorbed a small native population. What's more important is to see that modern and ancient mtDNA evidence are in agreement. This is slightly ironic, as it was modern mtDNA evidence -as interpreted in the late 90s- that largely launched the once successful and now semi-retired "Europeans are largely Paleolithic" meme. Christopher R. Gignoux et al. The invention of agriculture is widely assumed to have driven recent human population growth. However, direct genetic evidence for population growth after independent agricultural origins has been elusive. We estimated population sizes through time from a set of globally distributed whole mitochondrial genomes, after separating lineages associated with agricultural populations from those associated with hunter-gatherers. The coalescent-based analysis revealed strong evidence for distinct demographic expansions in Europe, southeastern Asia, and sub-Saharan Africa within the past 10,000 y. Estimates of the timing of population growth based on genetic data correspond neatly to dates for the initial origins of agriculture derived from archaeological evidence. Comparisons of rates of population growth through time reveal that the invention of agriculture facilitated a fivefold increase in population growth relative to more ancient expansions of hunter-gatherers. Recently, I've presented some conflicting evidence about the origin of modern humans in either East, or Central, or South Africa. 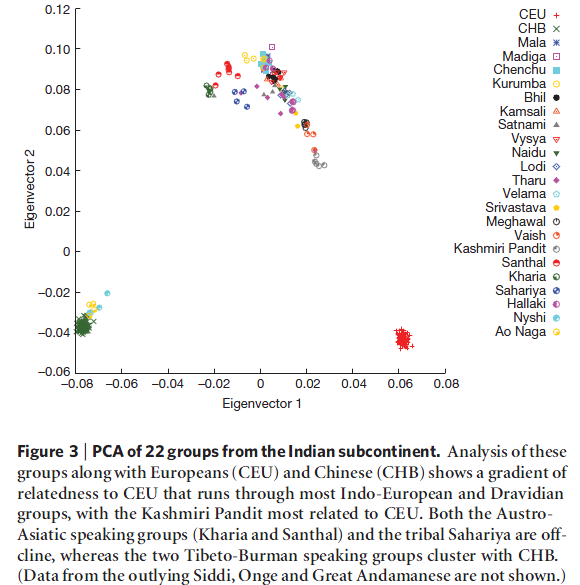 A new paper looks at the decay of phonemic diversity in world languages, coming to the conclusion that language itself may have originated in Southwest Africa. It is possible that, the greater phonemic diversity is due to ancient admixture between quite divergent peoples who possessed two different types of phonemic inventories, while most Africans inherited only the phonemic inventory of one of these peoples, which then decayed as per the author's theory away from Africa. In fact, I suspect that something much like #2 (the Afrasian-Palaeoafrican hypothesis) probably took place. I'll leave an evaluation of this paper to the experts, but it seems to me that South Africans do not only have a richer phonemic inventory, but also a set of phonemes (clicks) that seems peculiar to them, and may, possibly be part of a different language system than the one that most other languages use. Young infants are known to prefer own-race faces to other race faces and recognize own-race faces better than other-race faces. However, it is entirely unclear as to whether infants also attend to different parts of own- and other-race faces differently, which may provide an important clue as to how and why the own-race face recognition advantage emerges so early. The present study used eye tracking methodology to investigate whether 6- to 10-month-old Caucasian infants (N = 37) have differential scanning patterns for dynamically displayed own- and other-race faces. We found that even though infants spent a similar amount of time looking at own- and other-race faces, with increased age, infants increasingly looked longer at the eyes of own-race faces and less at the mouths of own-race faces. These findings suggest experience-based tuning of the infant's face processing system to optimally process own-race faces that are different in physiognomy from other-race faces. In addition, the present results, taken together with recent own- and other-race eye tracking findings with infants and adults, provide strong support for an enculturation hypothesis that East Asians and Westerners may be socialized to scan faces differently due to each culture's conventions regarding mutual gaze during interpersonal communication. 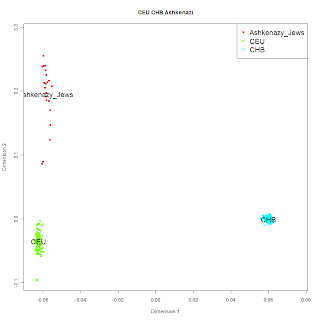 Different researchers than Gray and Atkinson, similar age estimates (their inferred trees do, however, differ). The supplement is available online (pdf). Our main analysis gives a 95% highest posterior probability density interval of 7110-9750 years Before the Present, in line with the so-called Anatolian hypothesis for the expansion of the Indo-European languages. our ability to predict time depths. 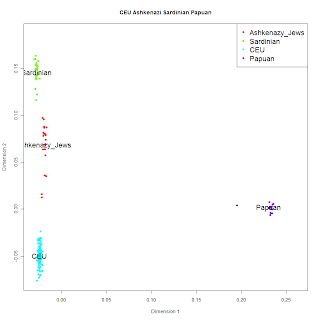 After several analyses of two data sets (Chapter 5), all our results agree with the Anatolian hypothesis that the spread of the Indo-European family started around 8000 BP. None of our analyses agree with the Kurgan theory that the spread started between 6000 and 6500BP. Summary. Nicholls and Gray have described a phylogenetic model for trait data. They used their model to estimate branching times on Indo-European language trees from lexical data. Alekseyenko and co-workers extended the model and gave applications in genetics. We extend the inference to handle data missing at random. When trait data are gathered, traits are thinned in a way that depends on both the trait and the missing data content. Nicholls and Gray treated missing records as absent traits. 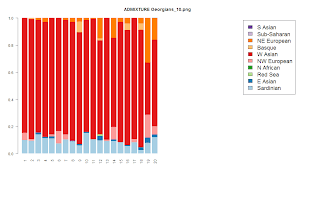 Hittite has 12% missing trait records. 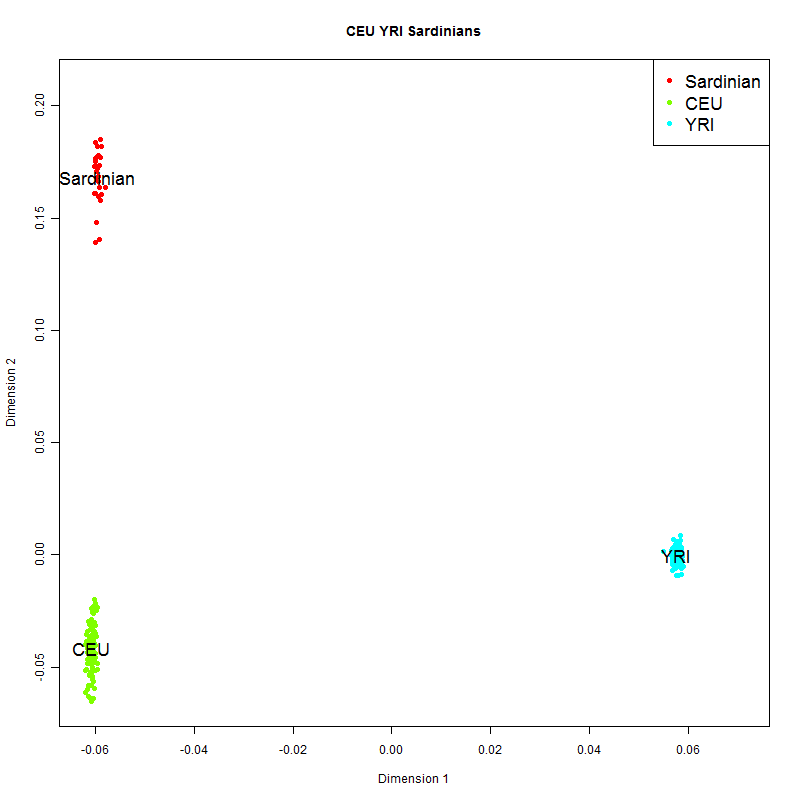 Its age is poorly predicted in their cross-validation. Our prediction is consistent with the historical record. Nicholls and Gray dropped seven languages with too much missing data. 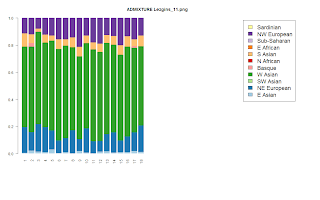 We fit all 24 languages in the lexical data of Ringe and co-workers. To model spatiotemporal rate heterogeneity we add a catastrophe process to the model. When a language passes through a catastrophe, many traits change at the same time. 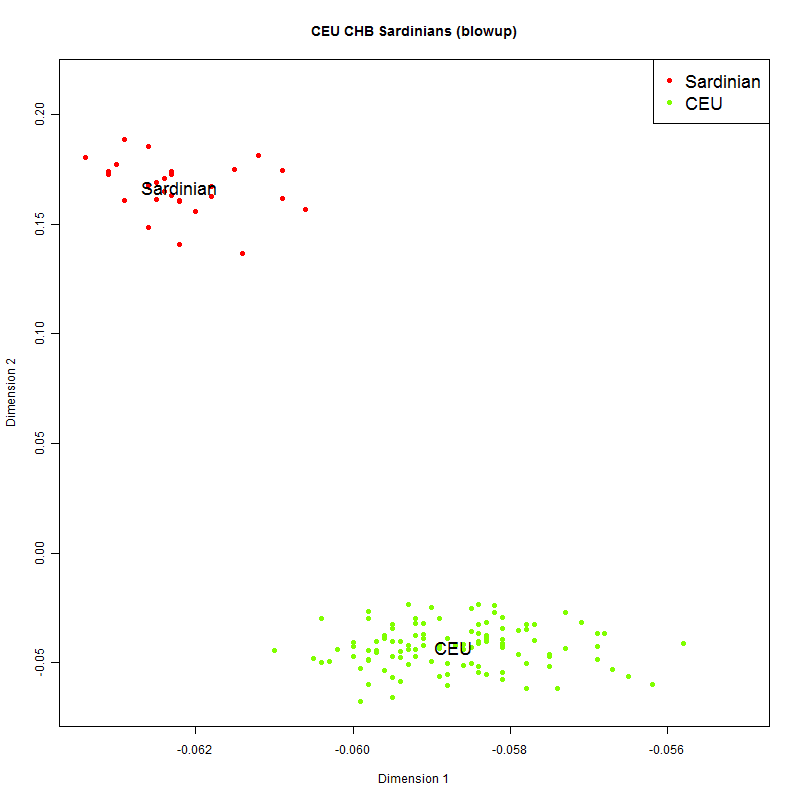 We fit the full model in a Bayesian setting, via Markov chain Monte Carlo sampling. We validate our fit by using Bayes factors to test known age constraints. We reject three of 30 historically attested constraints. Our main result is a unimodal posterior distribution for the age of Proto-Indo-European centred at 8400 years before Present with 95% highest posterior density interval equal to 7100–9800 years before Present. That, at least, is the hope. But a comparative study of linguistic traits published online today (M. Dunn et al. Nature doi:10.1038/nature09923; 2011) supplies a reality check. Russell Gray at the University of Auckland, New Zealand, and his colleagues consider the evolution of grammars in the light of two previous attempts to find universality in language. The most famous of these efforts was initiated by Noam Chomsky, who postulated that humans are born with an innate language-acquisition capacity — a brain module or modules specialized for language — that dictates a universal grammar. A few generative rules are then sufficient to unfold the entire fundamental structure of a language, which is why children can learn it so quickly. Languages would diversify through changes to the 'parameter settings' of the generative rules. The second, by Joshua Greenberg, takes a more empirical approach to universality, identifying traits (particularly in word order) shared by many languages, which are considered to represent biases that result from cognitive constraints. Chomsky's and Greenberg's are not the only theories on the table for how languages evolve, but they make the strongest predictions about universals. Gray and his colleagues have put them to the test using phylogenetic methods to examine four family trees that between them represent more than 2,000 languages. A generative grammar should show patterns of language change that are independent of the family tree or the pathway tracked through it, whereas Greenbergian universality predicts strong co-dependencies between particular types of word-order relations (and not others). Neither of these patterns is borne out by the analysis, suggesting that the structures of the languages are lineage-specific and not governed by universals. Languages vary widely but not without limit. The central goal of linguistics is to describe the diversity of human languages and explain the constraints on that diversity. Generative linguists following Chomsky have claimed that linguistic diversity must be constrained by innate parameters that are set as a child learns a language1, 2. In contrast, other linguists following Greenberg have claimed that there are statistical tendencies for co-occurrence of traits reflecting universal systems biases3, 4, 5, rather than absolute constraints or parametric variation. Here we use computational phylogenetic methods to address the nature of constraints on linguistic diversity in an evolutionary framework6. First, contrary to the generative account of parameter setting, we show that the evolution of only a few word-order features of languages are strongly correlated. Second, contrary to the Greenbergian generalizations, we show that most observed functional dependencies between traits are lineage-specific rather than universal tendencies. 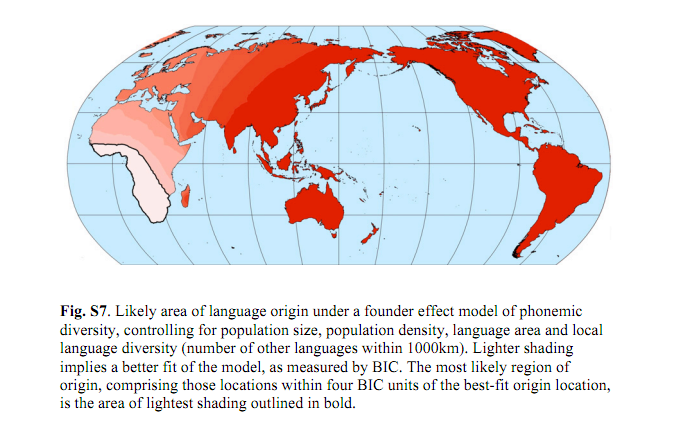 These findings support the view that—at least with respect to word order—cultural evolution is the primary factor that determines linguistic structure, with the current state of a linguistic system shaping and constraining future states. Modern Anatolian Muslims are only a part of the recent population of Anatolia, with a great part of the Christian population exchanged, killed, or forced to leave. So, I have always been skeptical of grand reconstructions of prehistory based on treating modern Anatolian Muslims as little modified descendants of the Neolithic population. I don't doubt that a great deal of their ancestry, averaged over broad scales, is Neolithic Anatolian, but extracting this ancestry from the mosaic of heterogeneous Muslim groups inhabiting the modern Republic of Turkey is no trivial task. 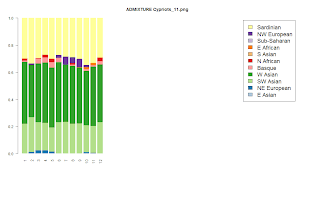 Even though the data from official Ottoman records and other sources such as local church accounts are contradictory (Charanis 1972; Vryonis 1986), it is clear that Greek and Armenian peoples comprised the majority, or at least a very sizeable minority, of the late-19th-century Anatolian population (Finkel 2005; Levy 2002; Shaw et al. 1976). Muslim Turkic and Kurdish groups from different ancestral clans and, more importantly, from different sects of Islam made up the largest remaining part of the population (Cahen 1968, 2001; Finkel 2005). Therefore, the population of the Ottoman Empire came from different ancestral backgrounds, lived together, and constructed communities based on their religious affiliations. 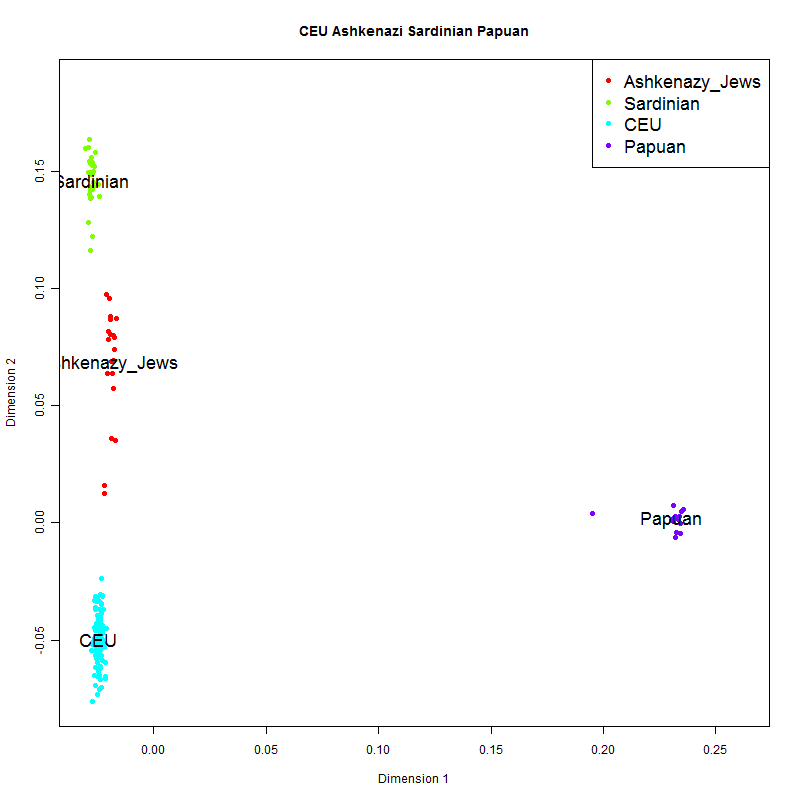 We worked in four geographically proximate Central Anatolian settlements located southeast of Ankara (see Figure 1) to test the abovementioned hypotheses and elucidate the regional complexity of Anatolian population history. Because of the current political sensitivities concerning ethnic–religious identity in Turkey, especially those relating to the Alevis and Kurds, the names of the specific settlements we visited are not identified in this article. Instead, for the sake of clarity, pseudonyms are used. This region, which we refer to as “Yuksekyer,” was selected for the study because, based on oral traditions and available historical records, it is home to linguistically, ethnically, and religiously distinct groups that live in close geographic proximity to one another. To assess the possible regional, religious, and ethnic differentiation in Central Anatolia, we collected additional samples from a settlement from Kizilyer, another region located about 500 kilometers east of Yuksekyer, the inhabitants of which are predominantly Alevi Turks. Merkez is the current political and bureaucratic center with about 6,500 inhabitants, making it the most populous settlement in the region (Devlet İstatistik Enstitüsü 2001). It was probably founded by Cerkez (Circassian) people who had migrated there from the Caucasus region in the 14th century. The inhabitants of the oldest known settlement, Eskikoy, claim a pre-Ottoman Karaman ancestry that traces back to a Turkic population that occupied the Konya region during the 13th century (Finkel 2005). To date, no historical records that confirm the connection between Eskikoy and its putative Karaman origin have been found. However, Ottoman records mention the presence of the Eskikoy settlement in the Yuksekyer region and place its foundation at around 1500 C.E. The residents of Gocmenkoy identify themselves with the Afsar clan of the Oguz tribe, to which the Kayi and Turkmen lineages also belong (Cahen 1968). Their oral history, supported by local historical records, indicates that these people came from Central Asia in the 16th century. The Kurdish-speaking inhabitants of Dogukoy were the last immigrants to populate Yuksekyer. They purportedly came into the region around 200 years ago from southeastern Turkey. For comparative purposes, we also collected 30 additional samples from another Central Anatolian region, Kizilyer, which lies about 500 kilometers east of Yuksekyer. This region is roughly comparable to Yuksekyer region in its size and population density. 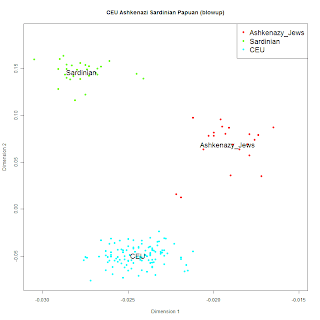 Haplogroup L is limited to Gocmenkoy. L is divided into informative subclades and is one of the less studied and more mysterious Caucasoid haplogroups; the authors erroneously state that it is more frequent in East Eurasians. In the Gocmenkoy sample it could very well be the legacy of Turkicized Central Asian Iranian speakers in which it is found at a high frequency. Most of the haplogroup Q is also found in Gocmenkoy and this may represent a genuine Turkic element. I find the high frequency of J2a (64.5%) in Dogukoy, the Kurdish settlement to be noteworthy. 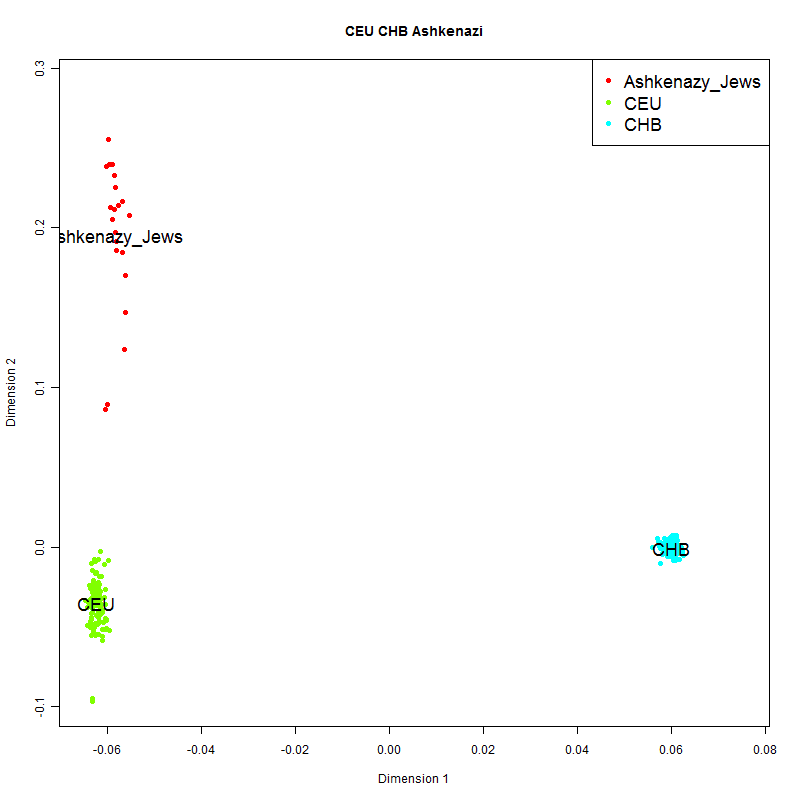 This haplogroup is also probably found at a high frequency in Parsis (although technically only J was studied in the relevant study), and I've noted before that a high J2/J1 ratio contrasts West Asian Indo-Europeans from Semitic groups. J2a also occurs at a high frequency in Indian upper caste populations, whereas it is virtually absent in low castes and tribals. The fact that the names of the settlements had to be obfuscated by the authors speaks volumes about the political sensitivity of the subject. Hopefully this line of research will be allowed to continue. 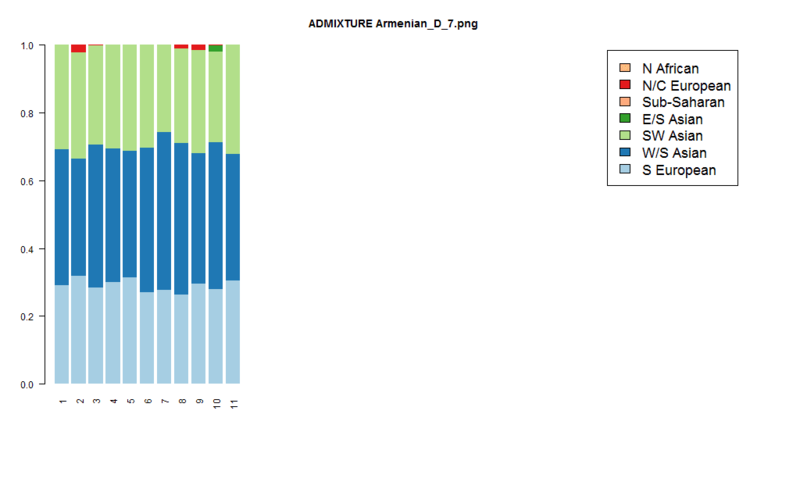 ABSTRACT Previous population genetics studies in Turkey failed to delineate recent historical and social factors that shaped Anatolian cultural and genetic diversity at the local level. To address this shortcoming, we conducted focused ethnohistorical fieldwork and screened biological samples collected from the Yuksekyer region for mitochondrial, Y chromosome, and autosomal markers and then analyzed the data within an ethnohistorical context. Our results revealed that, at the village level, paternal genetic diversity is structured among settlements, whereas maternal genetic diversity is distributed more homogenously, reflecting the strong patrilineal cultural traditions that transcend larger ethnic and religious structures. Local ancestries and origin myths, rather than ethnic or religious affiliations, delineate the social boundaries and projected identities among the villages. Therefore, we conclude that broad, ethnicity-based sampling is inadequate to capture the genetic signatures of recent social and historical dynamics, which have had a profound influence on contemporary genetic and cultural regional diversity. An interesting problem in population genetics is the following: how often are two individuals from a population A more similar to each other than either of them is to an individual from another population B? If this condition holds, then a and a' from population A are more similar to each other than either of them is to an individual b from population B. We then say that the trio of individuals is concordant. I will use the indicator function I(a, a', b) = 1 in case of a concordant trio, and =0 otherwise. The rationale behind this formula is straightforward: we are counting the number of all concordant trios, and dividing by n(n-1)m/2 since there are n(n-1)/2 pairs of individuals from A, and each pair is compared against all m individuals from B. It is 1 if the two populations are so well-differentiated so that every trio is concordant. 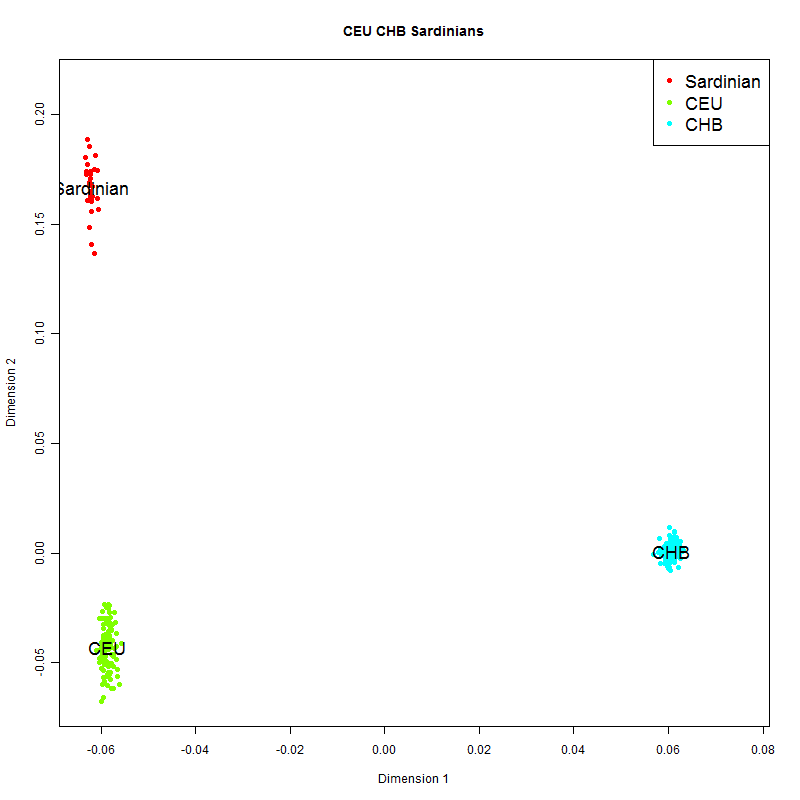 On the other hand, if the two populations are genetically identical, then each similarity comparison is equivalent to a coin toss (probability = 0.5) and we are testing this condition for two different individuals from A: hence the probability of concordance for each trio is 0.5*0.5 = 0.25. In a finite sample of individuals it is possible that the concordance ratio estimate may actually be lower than 0.25. We will see how this property gives some useful insight in some of the following examples. 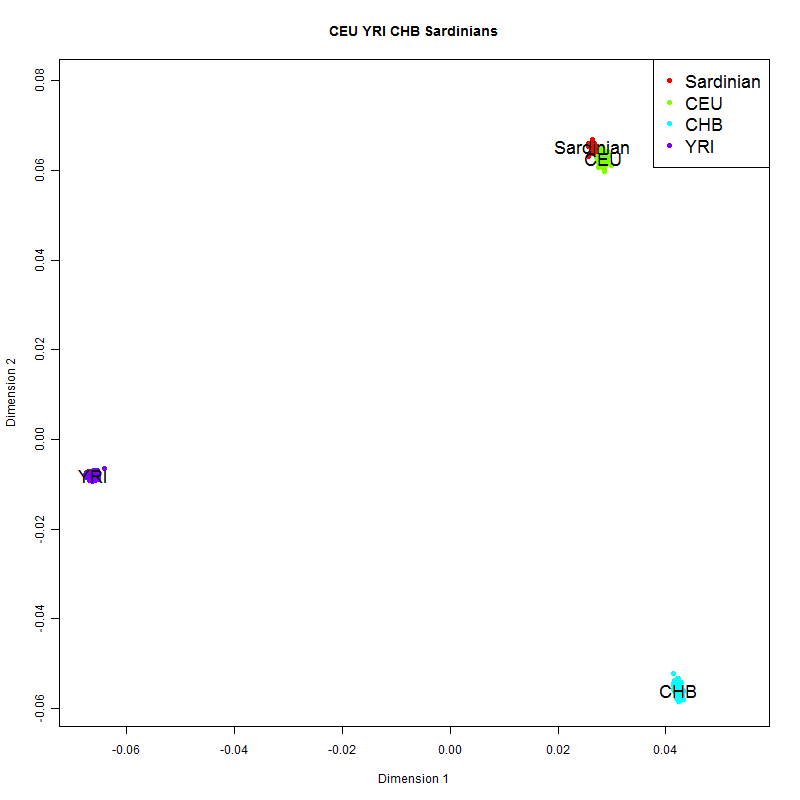 This is based on the Stanford HGDP set, including only individuals as recommended by Rosenberg (2006) in his H952 set. For each experiment only SNPs with at least a 99% genotyping rate have been retained. The first experiment is designed to showcase the concordance ratio in two well-differentiated human populations, 44 Han Chinese and 21 Yoruba Nigerians. 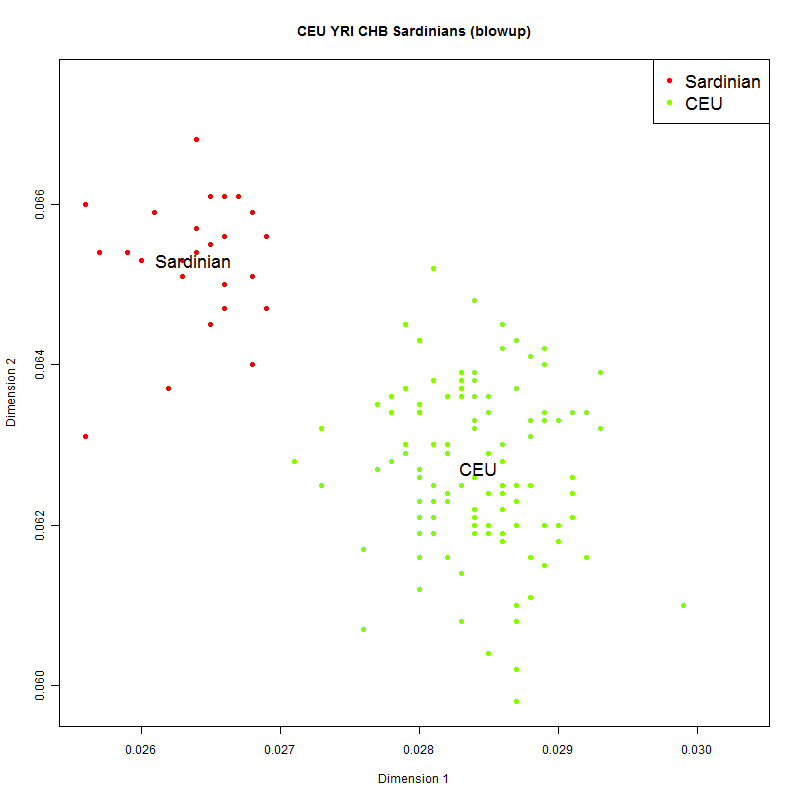 The analysis is based on 617,602 SNPs. That is, two Han Chinese are always more similar to each other than to a Yoruba and vice versa. I repeated the experiment, sequentially thinning the market set randomly by a factor of 10 using PLINK's --thin 0.1 argument. Concordance remained 1 for ~61k, ~6k, and ~600 markers, and became different than 1 (but still greater than 0.95) with 50 SNPs. 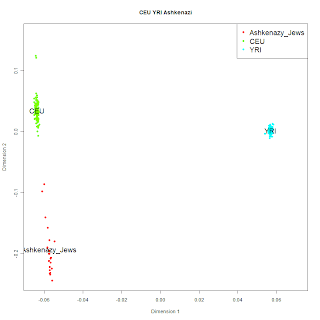 Genome-wide, or, across a sizeable number of markers concordance of Han vs. Yoruba and vice versa is perfect, while for a few random SNPs it may not be. In the next experiment, I have used 90 Britons (GBR) and 69 Mexican Americans from Los Angeles (MXL) from the 1000 Genomes Project. I have included only SNPs with 99%+ genotyping rate that are also included in the HGDP Stanford data, for a total of 351,521 markers. Notice the previously mentioned asymmetry: two Britons are virtually always closer to each other than they are to a Mexican, but a Mexican is sometimes closer to a Briton than he is to a fellow Mexican. This is due to the fact that Mexicans have variable European admixture, so a substantially European-admixed Mexican may be closer to a Briton than he is to one of his substantially Amerindian-admixed compatriots. 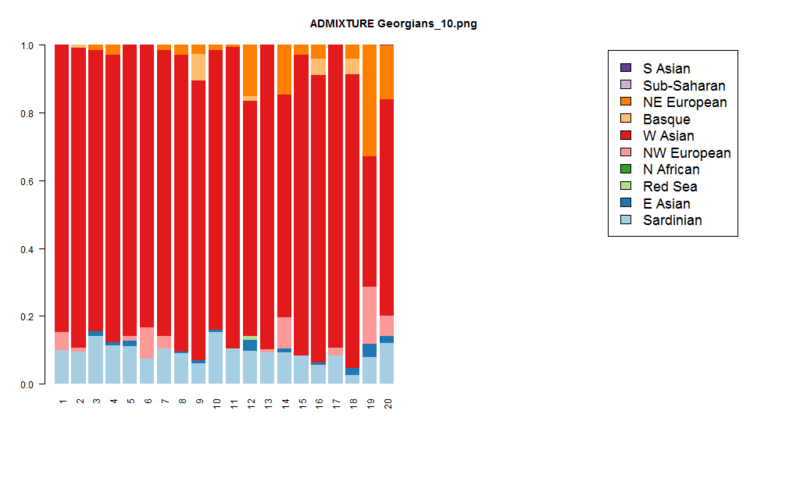 In the final experiment, I included HGDP European populations, together with 12 Dodecad Project Greeks. The analysis is based on 492,176 SNPs. Each row in the following table represents the first argument of the concordance ratio function, and each column the second one. The last row represents a test in which pairs of Greeks were compared against individuals from the population of each column. These comparisons were concordant 84.4% of the time against Russians (the most distant population), and 37.5% of the time against Tuscans (the closest one). When French individuals were used as an outgroup to compare against pairs of individuals from other populations, concordance ranged between 63.1% (for North Italians) to 100% (for Sardinians). The latter means that a pair of Sardinians is always closer to each other than to a French sample (or, at least, an HGDP French one). The concordance ratio is useful for personal genomics customers, as it puts their IBS similarities to various other individuals in perspective. 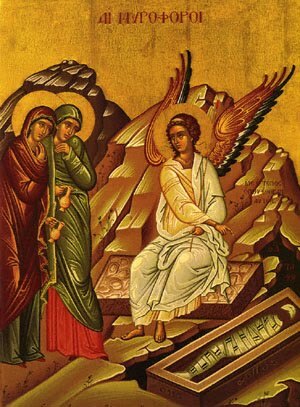 For example, a Greek should not be surprised if he matches a particular Tuscan more than he does a fellow Greek, nor should he seek mysterious Italian ancestors because of it, as such a discordant result occurs frequently. It is different from techniques such as PCA which allow the separability of individuals from different populations by projecting them on a number of dimensions, the first few of which are usually correlated with the inter-population fraction of genetic diversity. 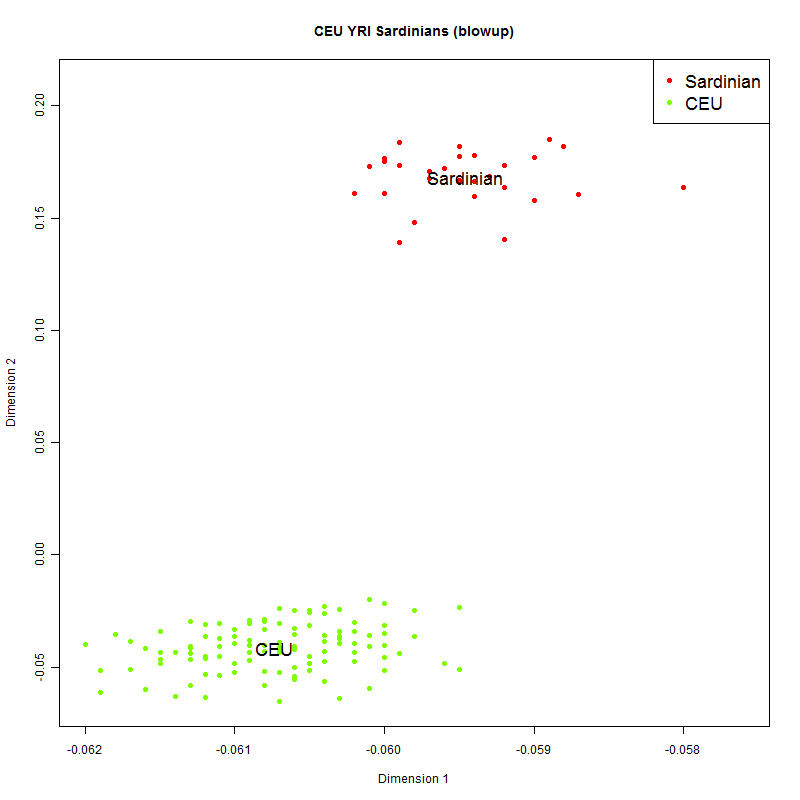 Hence, individuals that appear well-separated on a few PCA dimensions may in fact be overall more genetically similar to individuals from other populations across the full marker set. The concordance ratio avoids any accusation of privileging aspects of the genome (the ones that differentiate populations), as it is based on a single genome-wide similarity function for individuals. It is also different from clustering algorithms such as ADMIXTURE that infer allele frequencies in putative ancestral populations, again implicitly using markers with high frequency differences to estimate admixture proportions. Hence, a "match" in a marker with low population differentiation is treated differently as a source of evidence than a match in a marker of strong population differentiation. The concordance ratio avoids this issue by using a single similarity function for individuals that does not privilege one marker over another. A symmetrical similarity matrix, as output by plink --matrix --cluster command. Any similarity matrix file in the PLINK MIBS format will do. A file in which each row has a population name and the number of individuals from that population. Of course, individuals must appear in that order in the plink file, i.e., first the 12 North Italians, then the 25 Russians, etc. PS: The concordance ratio should not be confused with Witherspoon's ω fraction. That is defined by comparing all pairs of between- and within- population distances, and ranges between 0 (highest concordance in my terminology) and 0.5 (lowest concordance). The concordance ratio, on the other hand, tests all possible trios of individuals, and it also has the asymmetrical property explained above.